The Miracast Dongle a.k.a Wireless Display Stick or Multimedia Display Receiver, we simply called it Ca1. This little thing can mirror EVERYTHING from your phone/tablet (no matter it is iOS or Android) WITHOUT ANY CABLEs. High-resolution media files can be shared via AirPlay or MiraCast or DLNA by Wi-Fi with friends and family. Projectors, monitors or any device as long as it has the HDMI slot can work well with this stick. Enjoy movies with your friends now! * No additional apps or drivers is required. - Please read the instructions carefully. And contact us freely if there's something needed. - Better use the 5G WLAN technology can avoid delays or buffering. WIRELESS HDMI: Connect the Ca1 dongle without any cables or adapters via the Wi-Fi/5G signal, cast VIDEOs, MUSICs, PHOTOs, APPs, GAMEs or DOCUMENTs, all you can image from your SMARTPHONE, TABLET or LAPTOP's screen can be cast on any devices with a HDMI receiving slot as most of MINI PROJECTORs, MONITORs and TVs. EASY CONNECTION: (No need extra apps) Plug in the stick to your device - Search and connect the Wi-Fi - Mirror the media from your phone/tablet, 3 steps only! COMPACT SIZE: Portable as a USB Flash Drive, bring it to anywhere in your pocket, bags or briefcases. Perfectly use for HOME THREATRE on PROJECTORs or HD TVs, PRESENTATION for work or even PLAY PHOTOs in ART GALLERY/WEDDINGs. COMPATIBILITY: Both AirPlay (iPhone/iPad/MacBook) and MiraCast (Android phone/pad) are compatible! 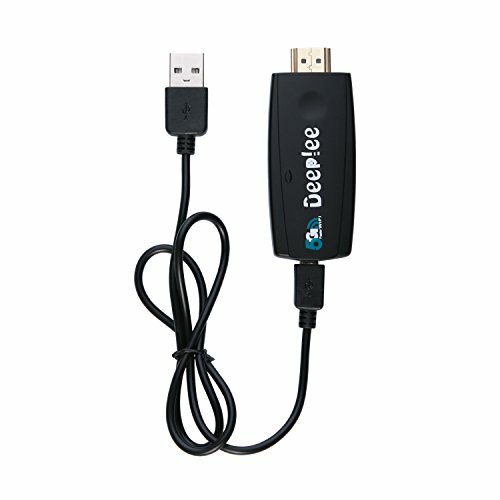 WHAT's MORE: DeepLee provides 1 year warranty.